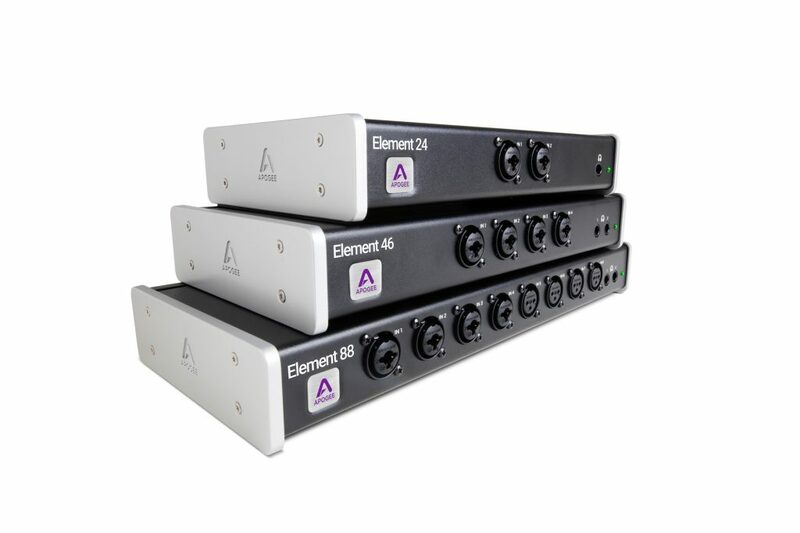 Apogee is excited to announce The Element Series. This all-new product family includes three premium Thunderbolt audio I/O boxes for Mac – Element 24, Element 46 and Element 88, each with a different number of analog and digital I/O. Element introduces a new control ecosystem that features an advanced blend of software and hardware options. The Element Series delivers Apogee Ensemble Thunderbolt recording quality in simple form factors that are available at unprecedented prices. Apogee is recognized by the professional audio industry as an innovator that sets the sound-quality standard in digital recording. Symphony I/O Mk II and Ensemble Thunderbolt are Apogee’s most recent flagship products.The essentials of excellent audio recording technology that make Ensemble Thunderbolt superior are embodied in the Element series. From the AD & DA conversion circuitry to the mic preamps and the clocking, each Element is designed to deliver legendary Apogee sound quality. An essential part of bringing this sound quality to and from your Mac is the interface connectivity. The Element series uses Apogee’s rock solid Thunderbolt driver for 1.41ms round-trip latency when using Logic Pro X. As an added element, the series also features Apogee Groove’s headphone output technology. This design dynamically optimizes sound quality for a wide variety of headphones, regardless of their impedance. you have connected. Apogee is also regarded as the company that revolutionized the audio interface user experience. Products like Duet and Ensemble Firewire created new categories in the home studio recording market and have been often imitated by other manufacturers seeking to capitalize on Apogee’s design success. Element evolves Apogee’s user interface approach again by offering broader more customizable options that extend beyond the physical hardware. The highly configurable Element Control software for Mac lets users set up workflows that meet their needs and the Element Control for iOS App lets them control the Elements remotely over wifi. Logic Pro X users can adjust Element I/O settings directly from their Logic Channel strips. And for those wanting more traditional desktop control, there’s the optional Apogee Control hardware, featuring a Duet like form-factor with 8 assignable buttons and a master control knob. Regardless which of these options you prefer, if you are using an Element, everything is under control. This entry was posted in News and tagged Apogee, Apogee Digital, Apogee Element 24, Apogee Element 46, Apogee Element 88, Element Series, Thunderbolt Interfaces.